Sholem's non-religious celebration of Passover acknowledges its roots as a spring festival and honors the powerful tradition of “Exodus” as a story of freedom. We’ll be reading from our Sholem Family Hagadah and feature group singing with musical accompaniment and plenty of opportunities for children to participate. This popular annual event will take place at Westside Neighborhood School in the Multi-Purpose Room (MPR) i.e. the theater/gymnasium. SPACE IS LIMITED: Sign up now (below) to ensure your seats & choose what you prefer to bring for the potluck. ADMISSION IS FREE! We will be passing a hat for donations to cover our costs ($1,000+) for room rental, youth helpers, paper goods and supplies. Please sign up for one item per each adult in your group, and one item for every 1-3 children you’ll be bringing. The items needed are listed below, with the numbers in parentheses referring to the total number of people we need to bring that item(s). Please sign up to bring items that seem to be lacking i.e. that would contribute the most to round out the potluck. Once you’ve signed up for your items, click “Submit and Sign Up,” and you’ll be taken to the next page. On this page, next to each item you have signed up for, you will be asked “How many people are in your party?” Since you need to add a number on each row, please put the “number in your party” on the first row, and “zero“ in each subsequent row, so we get an accurate count, and don’t double-count by mistake. Please plan to arrive with your potluck contributions 11:15-11:30 a.m. This will give all of us time to organize the potluck buffet, find our tables places, get everyone settled in and seated. THE PROGRAM WILL BEGIN PROMPTLY AT 12 NOON. If you are bringing food, please also bring serving utensils. Label all utensils and containers with your name. Since this is a potluck community event, we ask that everyone plan to stay at the end to help with a speedy clean-up. There is no admission fee, but suggested donation is $10-$20 per person. Finally, if you are having trouble signing up on this form, or having any other questions please email [email protected] -- include name, items and phone number -- and we’ll sign you up the old-fashioned way! If you have any questions, please you may contact Regan Kibbee regan (at) sholem (dot) org or (310) + 399-2259, or Carrie Ansell (310) + 467-5973. For more info about Sholem's programs for cultural Jews and multicultural families, visit: www.sholem.org. 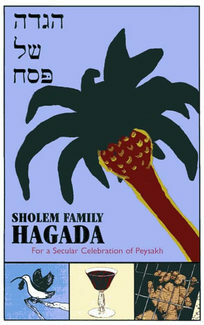 We look forward to a wonderful, freylekh (festive) Sholem Community Potuck Seder -- Hope to see you there!